Do you know the attributes of a successful email marketing campaign? Email marketing can be very effective. It enables a business to keep in direct contact with individuals. Globally, an astounding 269 billions emails are sent each day. So really invest your time to craft an email. It will stand out and draw the customer in. Email marketing is a great way to reach a large audience, as it is time and cost-effective. Email marketing can also be tailored to individual needs by the use of demographics. The more information you can collect about customers, the more options you will create for segmentation. Yet, if too much information is requested it may divert people from signing up at all. Ensure the relevant questions are asked during this process. For example, knowing the age or gender demographic of your consumers may be beneficial. This enables you to personalise an email to match their needs and interests. Segmentation is a powerful method to really tailor an email to specific users. This will result in a better customer service experience. Segmentation is based on types of data, including; Geographic, Demographic, Psychographic and Behavioural. This data can be used to tailor an email to an individual or a group of people within a segment. One way in which you could segment the email list is by engagement. A person or group of people who have not opened your email for a significant amount of time could be classed as an inactive user. You could then create an email marketing campaign to this group. Your objective is to re-engage their interest in your business. A different approach may be taken to active users. They can be targeted more specifically. For example, an email may be sent out promoting a sale, or a product or service that has just been purchased. Having a clear and effective call to action will help engage the customer. Ensure your email campaign has a specific goal. Make sure you focus or, if necessary, two goals. Bombarding the reader with multiple actions may confuse the buyer. It then becomes more difficult to understand the purpose of the email. A good call to action should stand out from the rest of the email. This could be done by colour or positioning of the action. A call to action could be in the form of a button or a link. It may be useful to place this away from the bulk of any text or images so it is not missed. The role of the call to action is to urge the reader to perform a particular action. It may help if the action is direct, persuasive and creates a sense of urgency. For example ‘Shop Now’ fits into all these categories. Any image added to your email should be relevant to your business. Images should reinforce your brand values and beliefs. The images could include brand colours or logos, to make it immediately recognisable. Alternatively, the images could reflect the message you are trying to convey in the email. Make sure the images remain professional. Avoid using any images, which bring no value to your campaign. Use a .JPG for an image rather than a .PNG file. A .JPG file is smaller in size and is acceptable by most email clients. This is important, as over 50% of open rates come from mobile phone devices. Adjust your email marketing campaign so emails can be read on mobiles and tablets as well as computers and notebooks. Some people do not “turn on images” while viewing emails. So make sure that you add the “ALT” attribute for images. Images should be embedded into the email. This is to avoid the server labeling your content as spam. When you include large images you are at a higher risk of gaining a spam score. Software such as Campaign Monitor and MailChimp allow you to embed images into your campaign. They also give data and reports on open rates, bounces and clicks to help measure the success of each email. Think about including email marketing as part of your marketing campaign? Get in touch with us. We can create professional branded emails that will stand out to your customers. 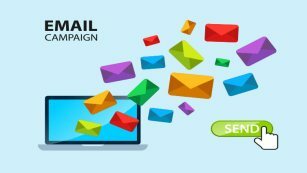 Got any questions about email marketing? Speak to Blackberry Design to see what we could do for your business. Get in touch on 01527 517309 or fill in our contact form.